A theory which identifies the Anglo-Saxon race with the Lost Ten Tribes. Its adherents, who claim that the promises given to Israel will be fulfilled with regard to England and America, are said to number 2,000,000 in England and the United States; and at one time they included in their ranks a member of the English House of Lords and a colonial bishop of the Church of England. They have issued several weeklies in defense of their views; and there is one publisher in London whose publications are devoted entirely to the cause. Strictly speaking, the believers in Anglo-Israelism do not form a sect, as most of its members retain communion with the Church of England, and they only hold their views as a supplementary pious opinion. The first person who seems to have broached these views was the eccentric Richard Brothers (1757-1824), who styled himself "Nephew of the Almighty," and, in his "Revealed Knowledge" (1794), claimed to be descended from David and prophesied that he would be revealed as prince of the Hebrews on Nov. 19, 1795. In 1822 Brothers published his "Correct Account of the Invasion of England by the Saxons, Showing the English Nation to be Descendants of the Lost Ten Tribes," which may be regarded as the foundation of the movement. He was followed by J. Wilson ("Our Israelitish Origin," 1845), who placed the theory upon its present basis; by W. Carpenter ("Israelites Found"), and by F. R. A. Glover ("England the Remnant of Judah"); and the movement obtained a somewhat distinguished adherent in C. Piazzi Smith, astronomer royal for Scotland, who in his bizarre work, "Our Inheritance in the Great Pyramid," attempted to prop up the cause by showing the identity of British weights and measures with those of the ancient Egyptians and Hebrews. 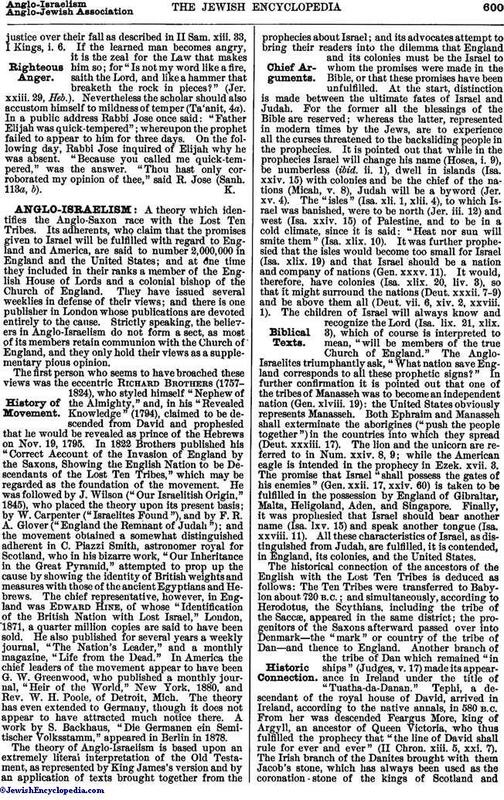 The chief representative, however, in England was Edward Hine, of whose "Identification of the British Nation with Lost Israel," London, 1871, a quarter million copies are said to have been sold. He also published for several years a weekly journal, "The Nation's Leader," and a monthly magazine, "Life from the Dead." In America the chief leaders of the movement appear to have been G. W. Greenwood, who published a monthly journal, "Heir of the World," New York, 1880, and Rev. W. H. Poole, of Detroit, Mich. The theory has even extended to Germany, though it does not appear to have attracted much notice there. A work by S. Backhaus, "Die Germanen ein Semitischer Volksstamm," appeared in Berlin in 1878. The theory of Anglo-Israelism is based upon an extremely literal interpretation of the Old Testament, as represented by King James's version and by an application of texts brought together from the prophecies about Israel; and its advocates attempt to bring their readers into the dilemma that England and its colonies must be the Israel to whom the promises were made in the Bible, or that these promises have been unfulfilled. At the start, distinction is made between the ultimate fates of Israel and Judah. For the former all the blessings of the Bible are reserved; whereas the latter, represented in modern times by the Jews, are to experience all the curses threatened to the backsliding people in the prophecies. It is pointed out that while in the prophecies Israel will change his name (Hosea, i. 9), be numberless (ibid. ii. 1), dwell in islands (Isa. xxiv. 15) with colonies and be the chief of the nations (Micah, v. 8), Judah will be a byword (Jer. xv. 4). The "isles" (Isa. xli. 1, xlii. 4), to which Israel was banished, were to be north (Jer. iii. 12) and west (Isa. xxiv. 15) of Palestine, and to be in a cold climate, since it is said: "Heat nor sun will smite them" (Isa. xlix. 10). It was further prophesied that the isles would become too small for Israel (Isa. xlix. 19) and that Israel should be a nation and company of nations (Gen. xxxv. 11). It would, therefore, have colonies (Isa. xlix. 20, liv. 3), so that it might surround the nations (Deut. xxxii. 7-9) and be above them all (Deut. vii. 6, xiv. 2, xxviii. 1). The children of Israel will always know and recognize the Lord (Isa. lix. 21, xlix. 3), which of course is interpreted to mean, "will be members of the true Church of England." The Anglo-Israelites triumphantly ask, "What nation save England corresponds to all these prophetic signs?" In further confirmation it is pointed out that one of the tribes of Manasseh was to become an independent nation (Gen. xlviii. 19): the United States obviously represents Manasseh. Both Ephraim and Manasseh shall exterminate the aborigines ("push the people together") in the countries into which they spread (Deut. xxxiii. 17). The lion and the unicorn are referred to in Num. xxiv. 8, 9; while the American eagle is intended in the prophecy in Ezek. xvii. 3. The promise that Israel "shall possess the gates of his enemies" (Gen. xxii. 17, xxiv. 60) is taken to be fulfilled in the possession by England of Gibraltar, Malta, Heligoland, Aden, and Singapore. Finally, it was prophesied that Israel should bear another name (Isa. lxv. 15) and speak another tongue (Isa. xxviii. 11). All these characteristics of Israel, as distinguished from Judah, are fulfilled, it is contended, in England, its colonies, and the United States. The historical connection of the ancestors of the English with the Lost Ten Tribes is deduced as follows: The Ten Tribes were transferred to Babylon about 720 B.C. ; and simultaneously, according to Herodotus, the Scythians, including the tribe of the Saccæ, appeared in the same district; the progenitors of the Saxons afterward passed over into Denmark—the "mark" or country of the tribe of Dan—and thence to England. Another branch of the tribe of Dan which remained "in ships" (Judges, v. 17) made its appearance in Ireland under the title of "Tuatha-da-Danan." Tephi, a descendant of the royal house of David, arrived in Ireland, according to the native annals, in 580 B.C. From her was descended Feargus More, king of Argyll, an ancestor of Queen Victoria, who thus fulfilled the prophecy that "the line of David shall rule for ever and ever" (II Chron. xiii. 5, xxi. 7). The Irish branch of the Danites brought with them Jacob's stone, which has always been used as the coronation -stone of the kings of Scotland andEngland, and is now preserved in Westminster Abbey. Somewhat inconsistently, the prophecy that the Canaanites should trouble Israel (Num. xxxiii. 55, Josh. xxiii. 13) is applied to the Irish. The land of Arzareth, to which the Israelites were transplanted (II Esd. xiii. 45), is identified with Ireland by dividing the former name into two parts, the former of which is ereẓ, or "land"; the latter, Ar, or "Ire." Philology, of a somewhat primitive kind, is also brought in to support the theory: the many Biblical and quasi-Jewish names borne by Englishmen are held to prove their Israelitish origin (H. E. Nicholls, "Surnames of the English People"). An attempt has been made to derive the English language itself from Hebrew (R. Govell, "English Derived from Hebrew"). Thus, "bairn" is derived from bar ("son"), "berry" from peri ("fruit"), "garden" from gedar, "kid" from gedi, "scale" from shekel, and "kitten" from quiton (ḳaton ="little"). The termination "ish" is identified with the Hebrew ish ("man"); "Spanish" means "Spain-man"; while "British" is identified with Berit-ish ("man of the covenant"). Perhaps the most curious of these philological identifications is that of "jig" with chag (ḥag ="festival"). Altogether, by the application of wild guesswork about historical origins and philological analogies, and by a slavishly literal interpretation of selected phrases of prophecy, a case was made out for the identification of the British race with the Lost Ten Tribes of Israel sufficient to satisfy uncritical persons desirous of finding their pride of race confirmed by Holy Scripture. The whole theory rests upon an identification of the word "isles" in the English version of the Bible unjustified by modern philology, which identifies the original word with "coasts" or "distant lands" without any implication of their being surrounded by the sea. Modern ethnography does not confirm in any way the identification of the Irish with a Semitic people; while the English can be traced back to the Scandinavians, of whom there is no trace in Mesopotamia at any period of history. English is a branch of the Aryan stock of languages, and has no connection with Hebrew. The whole movement is chiefly interesting as a reductio ad absurdum of too literal an interpretation of the prophecies. The Anglo-Israelite theory has of recent years been connected with the persecutions of the Jews, in which the Anglo-Israelites see further confirmation of their position by the carrying out of the threats prophesied against Judah. This side of the subject has been dealt with by T. R. Howlett in "An Anglo-Israel Jewish Problem," Philadelphia, 1892; supplement, 1894. 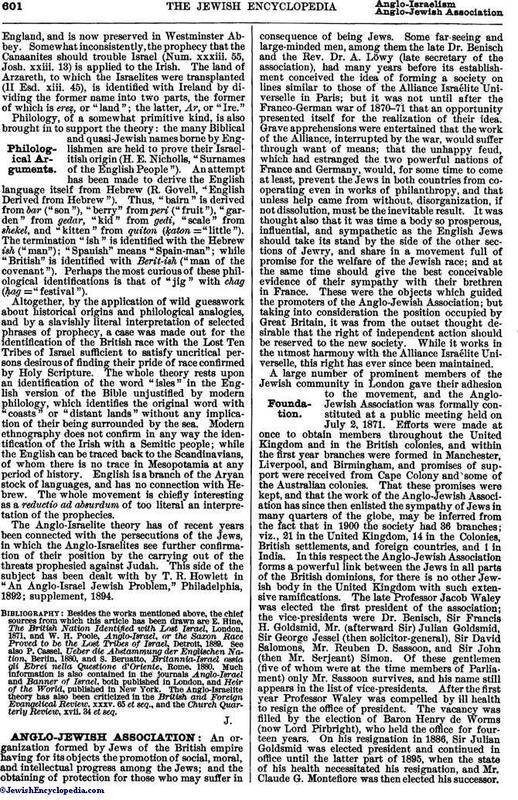 Besides the works mentioned above, the chief sources from which this article has been drawn are E. Hine, The British Nation Identified with Lost Israel, London, 1871, and W. H. Poole, Anglo-Israel, or the Saxon Race Proved to be the Lost Tribes of Israel, Detroit, 1889. See also P. Cassel, Ueber die Abstammung der Englischen Nation, Berlin, 1880, and S. Beruatto, Britannia-Israel ossia gli Ebrei nella Questione d'Oriente, Rome, 1880. Much information is also contained in the journals Anglo-Israel and Banner of Israel, both published in London, and Heir of the World, published in New York. The Anglo-Israelite theory has also been criticized in the British and Foreign Evangelical Review, xxxv. 65 et seq., and the Church Quarterly Review, xvii. 34 et seq.